Let's get real, picking the perfect paint is tough, especially when trying to pick the perfect white color for your trim. You would think white would be easy when in actuality it is probably the hardest of all colors to get right. Due to variables like types of light bulbs in your home and natural light through the day, white can sometimes look too yellow, too pink, or too blue. The struggle is real! 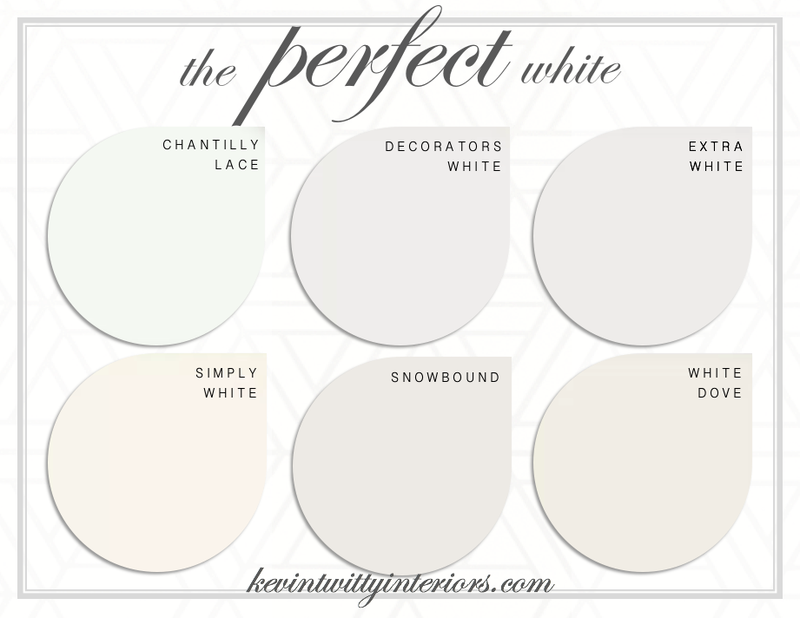 No worries, I am here to give you a list of white paint colors loved by the top designers in the biz. Benjamin Moore Chantilly Lace OC-65. Chantilly Lace is a cool white. Their is a slight blue undertone which works great for the unquestionably crisp look. It is perfect for cooler toned walls. Benjamin Moore Decorator's White OC-149 . This is a go-to for me when I do not want to worry. It works in most designs and it a fairly true white. Their is a slight cool undertone but is not very noticeable. Keeps most highly OCD people sane. Sherwin Williams Extra White SW7006 - If you want a whiter than white paint, this is the color for you. It has a slightly cool undertone which allows the eye to see it as a sharp color. Similar to Chantilly, it works great with cool colors. If you have a traditional home, this may not be the one for you. Benjamin Moore Simply White OC-117. This is a clean modern white that works well with grays. It has a real clean feeling to it. It has a warmer undertone to it without being yellow. The name says it all, simply white. Sherwin Williams Snowbound SW7004. Snowbound is a neutral white with a slight grey undertone, meaning it works perfectly next to warm and cool wall colors. It's perfect for the modern home who wants a crisp white without looking cold. Benjamin Moore White Dove OC-17. No surprise this is Benjamin Moore's most popular white. It has the slightest touch of warmth that flows seamlessly in 99% of other colors. The warm undertones tend to be very pleasing to the eye.